Address Data Center: Moscow, Korovinskoe Highway 41. Building Data Centre - brick, detached, situated on the territory enclosed by a concrete fence. The total area of ​​1,735 hectares. In the main building there are two computer rooms and an area of ​​289 269 square meters, designed for 148 and 133 rack space, respectively. Computer rooms are structured in the form of pressurized zone ("house within a house") of sandwich panels. Started the construction of the third hall, in a separate building to be erected next to the existing data center. Facilities will be designed for 90 racks. Floor height in the halls (Finished floor) is 660 mm. Part of building the data center is divided into 2 floors, this part furnished office, household and auxiliary facilities (including workshop, security room, installation of gas fire). 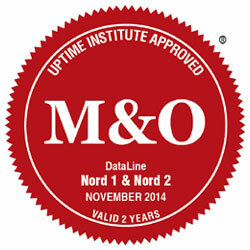 Data-center has been certified by Uptime Institute. Fuel tanks diesel generators are designed for 6 hours, with a contract for prompt delivery of diesel fuel, which will provide data center work even during long-term failure of urban power, while power will be provided with all the engineering systems and office premises data centers. Cooling system is built on the equipment Hiref. In computer rooms set precision dual-circuit air conditioning freon TADR1002 Downflow. The cooled air from the air conditioner is under the raised floor and then, through the perforated floor tile, blown into the "cold" corridors between the uprights. Air conditioning in rooms are reserved under the scheme N +1 (one room air conditioner on - reserve). External condensing units (two for each air conditioner) are placed on the site next to the building. In areas DPC installed integrated security system "ORION" produced by BOLID (Russia). Sensors equipped with both the perimeter and interior doors DPC. After arming sensors (all sensors data center or sensors located in the selected room or single sensor) system begins to monitor their condition. When a sensor is given a voice message that is duplicated by visual means. Message triggered sensor recorded in the system log. Permit regime on the territory of the data center is provided with system access control with contactless cards as personal identifiers. At the entrance to the data center organized a sluice room. At the door is equipped with ACS (enter the data center doors in computer rooms and other critical facilities), set the anchoring part, and on the door frame - the body portion of the electromagnetic lock type AL-300 Premium produced by «Roxie Entrance®». At a signal from the fire alarm system all doors are automatically unlocked for unimpeded evacuation. storing video archives from the cameras - from one month. The complex security video surveillance devices include fixed color IP-camera internal and external performance, digital recorders, color video monitors. Upon customer request is possible to install additional cameras in the halls. The contract with the Federal State Unitary Enterprise "Security" Russian Ministry of Internal Affairs ("Panic Button"). Machine rooms reserved DPC automatic installation of gas fire designed for early detection of the source of fire, issuing a fire alarm and automatic fire. In an extinguishing agent accepted Freon 125, which is stored in modules PGM type (module gas fire). Method of fire - volume by filling the protected space pairs Freon 125 to create a fire extinguishing concentration. To detect deck in the protected premises used smoke detector placed in the working space of the hall and under the raised floor. Installation of security and fire controlled device "ROSA-2SL». Trays SCS computer rooms are located on the ceiling. Switching equipment SCS and active equipment of the local area network (LAN) is mounted in a 19-inch cabinets and racks that are installed in two computer rooms, data centers. In switching centers (CC) rooms used cabinets NetShelter ™ SX 42 RU height and width of 750 mm production APC, which house the fiber optic patch panels, cable management and LAN switches. Switches halls and horizontal cabling is fully duplicated, custom closet connects to each of the two switches in the CC line of 1 Gbit / s.
DPC in Korovinskoe highway connected with fiber-optic communication lines a communication on the court MMTS-10 (own cable 16 fibers) and DPC upland. The building is arranged two independent telecommunications input. To organize communication equipment provided open 19-inch rack, computer rooms located near the pits telecommunications input. If necessary bandwidth to the data center for upland can be expanded through the use of existing equipment seals CWDM PacketLight (up to 80 Gbit / s), or the hire or purchase of additional optical fibers. For the provision of telecommunications services to customers data center has the necessary set of licenses.